The Big D (not to be confused with this Big D) . Embraced by people who have witnessed the struggle of discrimination, dismissed by those who feel threatened by the effects of affirmative action. However, the Big D, Diversity, has largely faced indifference. And, that’s what really kills a movement. In working to create a global community with Idealist.org, we began to explore the concept of a tribe. As in: “I’ve found my tribe.” But, what is a tribe? Truly? This common phrase typically describes a homogenous group of people. But, a tribe, by definition, is a group of people who share a common language, customs, and beliefs. Within that IS diversity – big, small, smart, simple, elderly, infant, wealthy, poor. 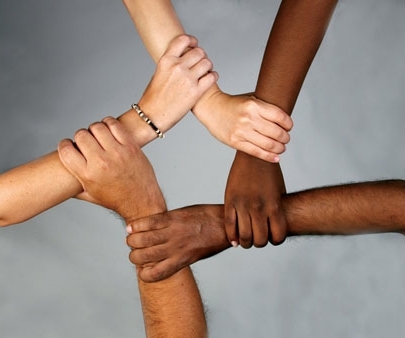 When I look at an ad with the token black man, or Asian woman, their hands in a star, everyone made to look exactly the same, except skin tone, I feel disheartened. As if this is diversity. Today we’re looking at the new face of diversity. AND, apologizing that it’s taken so long to get here. In their controversial Super Bowl Ad, they brought issues of immigration, diversity, and patriotism to the forefront. It subtly says America is beautiful BECAUSE of it’s diversity. Boldly done. Cheerios takes a very different “All American” approach, bringing diversity to the breakfast table. Separating and celebrating diversity keeps it, well, separate, but the subtle approach may be more effective in implanting it as a societal norm. Diversity isn’t always about race; it’s about challenging social norms regarding what people need to be for certain roles. This quiet shift in expectations stopped me dead in my tracks on Burnside. 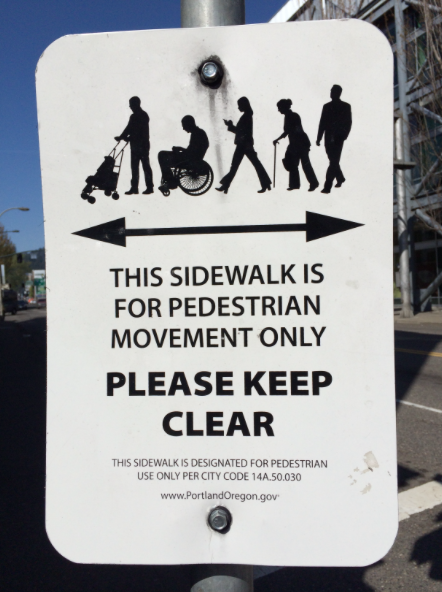 Here, race isn’t an issue in the black/white sign, but the profiled figures show a woman in a business suit, and a man pushing a stroller. You’re a model for us all, City of Portland. We propose subtly adding diversity to your visuals, particularly when there are no clichés present. For example in creating lifestyle photos for an apartment complex, show a gay couple at dinner, a woman with a prosthesis running in the park, or a mixed race family having breakfast together. Another concern may be… “It’s just not representative of the demographic.” (See Portland’s census data.) This is a tough one, but it is still worth the effort, because diversity IS there, it’s just a smaller segment. For example, Portland’s demographic shows 25% people of color and has the 7th highest LGBT population in the nation. Do you really want to leave them out? Create one visual in the next month that integrates diversity.